Anything you could possibly need to bike, you can find at this online biking superstore. 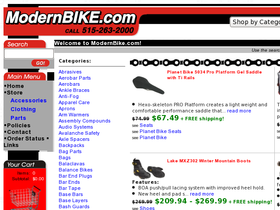 ModernBike.com carries everything from bikes, headlights, cycling tools, training wheels, wheels, and chains to apparel, audio systems, batteries, cameras, sleeping bags, DVD’s, goggles, hammocks, mountain boots, and the list goes on. If there is something you can’t find at ModernBike.com, this store guarantees to help you find it so there is no way you won’t find the biking merchandise you desire. With top brands like Gatorade, A-Class, BionX, Fox Racing, GoLite, Velocity, and more, you are sure to receive the highest quality products. Check out RetailSteal.com today for incredible ModernBike.com savings, ModernBike.com codes, and ModernBike.com deals. Shipping rate is $6.99 for orders within the 48 contiguous United States. See website for other shipping information and details. Shop at Modern Bike and you'll find a huge selection of cycling accessories for up to 60% off. Act now and take advantage of up to 20% off Pearl Izumi apparel and accessories from ModernBike.com. Check out ModernBike.com and enjoy free shipping on select items. Click link to shop. Buy a Bike Fit Systems Plumb Bob for only $19.99 at Modern Bike. Click link to shop. At Modern Bike, pay only $20 for select t-shirts. Click link to purchase.